Arriving on Collector’s Edition Blu-ray this week is J. Lee Thompson’s “10 to Midnight”. Much like Shout! Factory’s other big release this week, “Cobra”, this is an 80’s action-horror hybrid with an action icon as its’ star. The two films however are very different, although they are both gritty and sleazy. 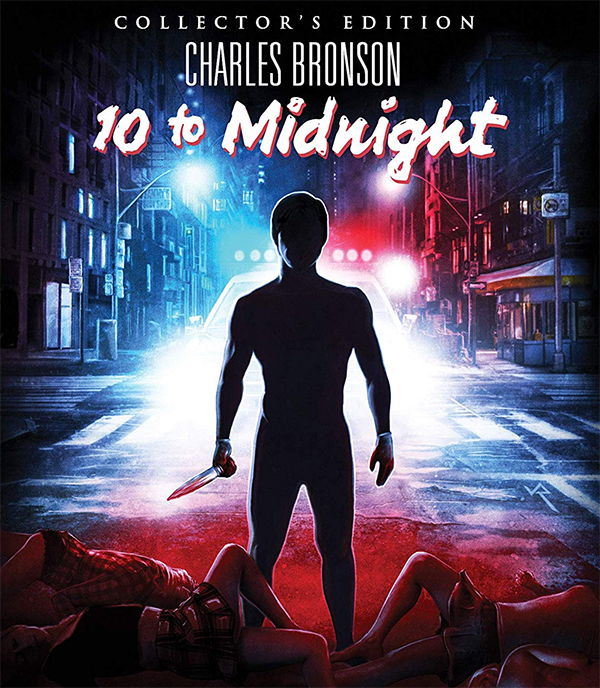 “10 to Midnight” stars Charles Bronson as Leo Kessler, a detective that is on the hunt for a serial killer (Gene Davis) that just murdered his daughter’s childhood friend. What sets this deranged killer apart from the killers in other films is that this one (who is named Warren Stacy), removes all his clothing before taking a life. Yep, he is a naked slasher. It may sound odd, but its’ quite effective. There is something about a killer that is hiding behind nothing. No mask, no hoody, no cloak. Just his naked self and a knife. I think if the killer wasn’t naked, nobody would remember “10 to Midnight”. If you are familiar with this one, then you know that the killer sets his sights on the Kessler’s daughter, Laurie (Lisa Eilbacher) and the detective along with his new partner Pail McAnn (Andrew Stevens) will stop at nothing to protect her. “10 to Midnight” is not one of my favorite Bronson films but I do like the horror elements. I prefer almost any of the “Death Wish” sequels. However, if you are a fan, Shout! Factory has loaded this release with tons of bonus content. Not only do you get a new 4K scan but there are quite a few interviews with various cast members. I also got to say, I love the cover art to this thing. It is simple yet beautiful.